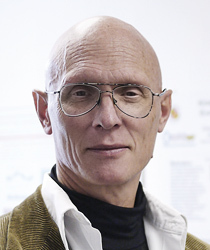 Professor Ray Phaneuf joined UMD’s Department of Physics in 1985, where he used electron diffraction to study phase transformations on stepped Si(111) surfaces, resulting in the identification of a thermodynamically driven faceting associated with the formation of the (7x7) reconstruction. In 1989 he visited Ernst Bauer’s group in Clausthal, Germany, using low energy electron microscopy (LEEM) to image this faceting in real time. In 2000 he joined the Department of Materials Science and Engineering, and began studies of directed self-organization during growth and sublimation on semiconductor surfaces, using lithographic patterning. He was a founding member of the UM-MRSEC. In 2006 he was a visiting professor at the National Nanotechnology Laboratory, in Lecce, Italy. He is the founding director of the Interdisciplinary Minor in Nanoscience and Technology at the UMD. He is the author of more than 80 papers in archival journals, and has given over 40 invited talks on his work in the U.S., Europe and Japan. He was named the Laboratory for Physical Sciences Faculty Researcher of the year in 2002. In addition to MSE, he has affiliate positions in Physics and the Department of Electrical and Computer Engineering. His current research is in the fields of directing self-assembly of nanostructures at the mesoscale, plasmonics, and the application of nanotechnology to the conservation of cultural heritage. Nanotechnology, surface physics, low energy electron microscopy, photoemission electron microscopy, scanned probe microscopies, templating for directed self-assembly. “Evolution of Patterned GaAs(001) during Homoepitaxial Growth: Size vs. Spacing,” H.-C. Kan, R. Ankam, S. Shah, K.M. Micholsky, T. Tadayyon-Eslami, L. Calhoun, and R. J. Phaneuf, Phys. Rev. B 73, 195410-1,-8 (2006). Van Order conducted a semester abroad/internship at TU Dresden last summer, and shares his experience here. Award will allow Hiebert to extend her work at the Museum Conservation Institute. Timothy Corrigan’s work highlighted by W.V. Division of Science & Research. »Marquardt showcases conservation work in pursuit of $5K Open Innovation Award. Amy Marquardt uses nanotechnology and materials science to design protective coatings for silver art, artifacts. Marquardt honored by American Ceramics Society. Amy Marquardt uses nanotechnology to protect silver art and artifacts. Professor presents work on nanocoatings used to protect art and artifacts. Grad student partners with conservators to save works in silver and bronze. MSE alumnus and current students recognized by National Science Foundation. Graduate student Amy Marquardt wins CIC-Smithsonian Fellowship. The program is part of a broad partnership between Maryland and Trento, Italy. Livingston, Phaneuf will discuss preservation of stone and metal. Grad student will attend American Vacuum Society Symposium, present work on protecting silver artifacts. Students create lab-on-a-chip device for use in targeted cancer therapy. Work covers plasma-polymer interactions in photolithography at the nanoscale. Microscopy, spectroscopy and microanalysis used to analyze bronze art. Students design and create prototype dynamic MEMS microphone. Seniors present work on novel shape-memory polymer stent. Research explores nanostructure evolution on patterned surfaces. Work on nanostructures and templating continues to receive attention. Program fosters collaborations, provides project leadership training. Story on "growing" computers featured online, in print, on TV. Guo, Kan, Tsai, and Tadayyon-Eslami present recent work. Course will cover microsopy and nanostructure characterization. Professor shares recent work on GaAs(001) mechanisms. Work by professor and student in forthcoming issue. Two MSE professors were awarded a NSF-NIRT grant for $1.2M to investigate "Nanotechnological Manufacturing: Nanostructured Polymers Designed for Plasma/Energetic Beam Templating of Materials".